It's been a while since we've published a new layout, but this one was a special request. Steve and I often get requests from readers of Philofaxy and My Life All In One Place and usually we're happy to oblige, although because of the various other demands on our time it won't always be overnight. A reader who liked the Personal CC inspired layout asked if we could produce an A5 version. Well, of course we could. The CC look is clean and uncluttered and respects weekends when so many layouts seem to consider them an inconvenience. You can download a 2013 set as either a Word file or a PDF file. They are created as A4 documents. To use them as A5 inserts, print the document in booklet mode on A4 paper, then use a guillotine to divide each sheet into two and punch the required holes, which the templates are set up with mirrored gutters to accommodate. Or, if you have A5 paper, then either the printer or the PC will scale it to size for you. 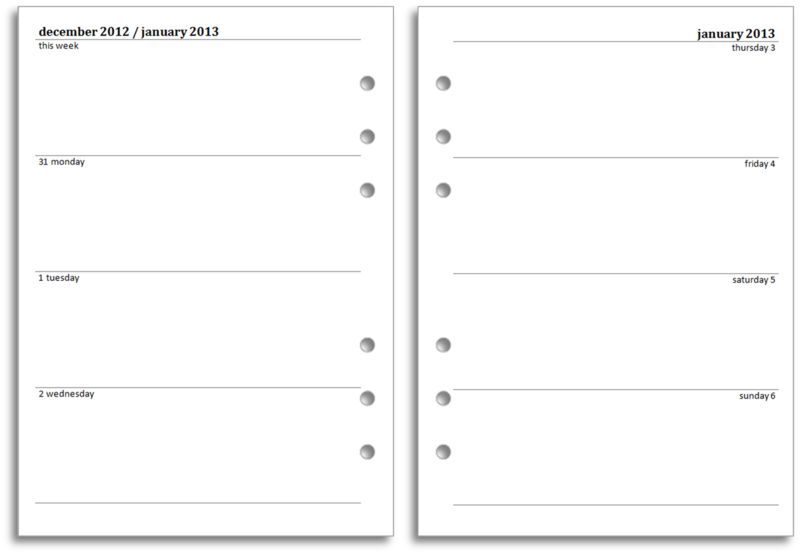 As well as the Personal version on A4, we also have a Personal version set up for printing on Personal Filofax paper. You can download a 2013 set as either a Word file or a PDF file. 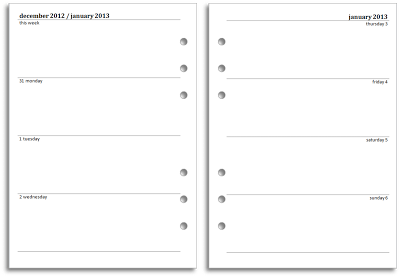 To print the document on Personal Paper you might find this help guide useful. Similarly if you wish to make your own alterations to the files you can download the Word Base file and the Excel data file (You will need both files and should undertake the mail merge as described above.). That's not a problem I've heard reported before. Box.net is the service I use to host the files and I'm not aware that I have passed any limits. Since tomorrow will be the first of the month and presumably any monthly limits will reset then. If that doesn't work for you then give me your email address. Thank you - you were right: Today it´s working without any problem! A big thanks for those great layouts for download. I love them and my planner is full of your templates. I also started my own 1000 books project... Thanks a lot!